No professional journalists were present to take up Holt’s challenge. The local session of the National Issues Forum was sponsored by the Oconee Progressives. The group also is joining with the congregants of Browns Chapel Baptist Church outside Bishop for an hour-long event called “Long History, New Friends” at 4 p.m. on March 23. The two groups are inviting everyone in the community to get to know each other through an exercise that involves conversational pairings and discussion of nonpolitical topics. The National Issues Forum is a non-partisan, nationwide network of civic, educational, and other organizations and individuals interested in promoting public deliberation. Holt told the group that the Oconee County session, officially titled “A House Divided: What Would We Have to Give Up to Get the Political System We Want?” was one of nine scheduled for March around the country. Holt, a retired University of Georgia Adult Education professor who is active with Oconee Progressives, also moderated a National Issues Forum in Oconee County on immigration a year ago. The Oconee Progressives formed in 2017 and has community building as one of its central goals. It also was the sponsor of the National Issues Forum on immigration. The 12 persons who joined the group at 3 p.m. on March 9 at the Oconee County Library in Watkinsville formed a semi-circle. At least two others joined the discussion shortly after it began. The deliberations were to center around three topics, spelled out in a video shown at the beginning of the meeting and available as a trailer HERE. The topics and background information also is provided in a downloadable document, which Holt referenced as she began the discussion. Participants received a shortened version at the session. “The problem is that the way we talk is poisoning public life. The ‘outrage industry’ rewards people for saying and doing the most extreme things,” the support document stated. “The problem is that wealthy, powerful special interests game the political system, making it impossible to find compromise,” according to the document. “The problem is that our most important decisions are being made too far away from home,” the document asserted. Before turning to those three topics, Holt asked the participants if they felt people in Oconee County are concerned about the divisions in the country. “I think the media today is trying to be so balanced, trying to give all sides of the story,” Deborah Gonzalez, former Georgia House District 117 representative, said. Participants criticized the weekly The Oconee Enterprise for its selection of columns and letters to the editor, saying they reflected this kind of balancing. The Athens Banner-Herald covers Oconee County news only irregularly, and the weekly The Oconee Leader mostly includes sports and features. “We have a long history in America of putting up a wide variety of opinions in newspapers and magazines and things like that,” another participant said. “I do feel that something should be regulated like hateful rhetoric or calling for the harming of somebody else for their beliefs or ideas,” another of those at the forum said. Wallace introduced the second option or topic by asking participants what “fairer rules for politics” meant to them. Another participant returned to the media. The participants struggled with the implications of local versus national standards. I think that the whole reason why the EPA exists to begin with is because it was pretty clear that there was effort that was piecemeal,” one of those present said, referring to the Federal Environmental Protection Agency. “If there’s no regulation in place, what are we going to leave our kids?” she asked. “I agree that we do need certain national standards,” another of the participants said, mentioning the EPA and the Interstate system as examples. “But there are so many intrusions in our lives,” she said, “and that they keep getting more and bigger and bigger and, it really isn’t anything that’s for our benefit. Holt brought the discussion to a close by offering some summary comments and questions, including the one about what journalists should have taken away from the discussion. “As a working mom, I am either working or doing family stuff,” one of those present said on reflection on the afternoon. “We can agree or agree to disagree in a peaceful way,” another woman said. Pat Priest, one of the organizers of the Brown Chapel event on March 23, said I an email message on March 1 that the goal it allow to people “to get to know others in the area in a fun way." Priest and the Progressives held a similar event last January. “Attendees and church members will move in turn to new conversational pairings in response to a series of prompts given over a sound system,” Priest said. The structured portion of the event will last just one hour, but participants can stay afterward to talk to new and old friends, Priest said in her announcement. Light refreshments will be served. Browns Chapel, 1030 Brown Chapel Road, with strong hisstorical ties to the county’s African-American population, is 121 years old. Reverend J. Ricardo Smith is the church’s 16th pastor, according to Priest’s news release. Teens are encouraged to attend the event. 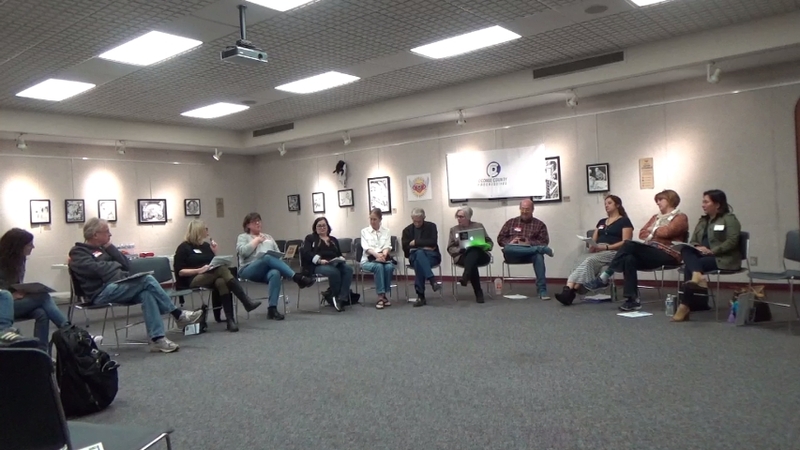 I was not able to attend the National Issues Forum at the Library on March 9, but Becky Moore did attend and agreed to set up the camera and record the session for me. The video below is of that session. The staff-written stories aside, The Oconee Enterprise a very personal, democratized newspaper. Our standard is that columnists must be local writers, not syndicated from elsewhere. We want to empower high school students by giving them a voice and treating them as equals. We give them independence and do not instruct them on what to write. And we find experts to write about such things as science or gardening. Our parenting column is a local mom who has adopted children. Even our cartoonist is local. That's important to me. The Oconee Enterprise will not be as impersonal as the Banner-Herald or as liberal as the Flagpole.